Once of my favorite animated films of all time is Brad Birds, The Iron Giant. This is a brilliantly fantastic movie that was a box office flop. That's because Warner Bros. did a terrible job marketing the film, it's like they went out of their way to make it fail. It really is awful how they treated this movie. The Iron Giant rose above it's demise and is considered a modern classic animated film. The films director Brad Bird went on to be a two time Academy Award winner and directed my two favorite Pixar films, The Incredibles and Ratatouille. If you've for some reason not seen The Iron Giant I suggest you do so now, to witness the magic. When the movie came out it was the animated film I had been waiting to see my whole life at that point. I was kind of Disneyed out and looking for something different, something for me. The Iron Giant was it. If you live in the L.A. area and have $10 bucks in your pocket then you can join director Brad Bird and the rest of his crew for the 10 year anniversary screening of the film! The screening will take place on October 23rd at the Fletcher Jones Foundation Auditorium in Burbank, California. Brad Bird will have a Q & A at the event. Are you going to be there!? For more info on the event click here. Parking is free. Proceeds benefit the ASIFA-Hollywood Animation Archive. This event is made possible by a generous grant from the Walter Lantz Foundation. 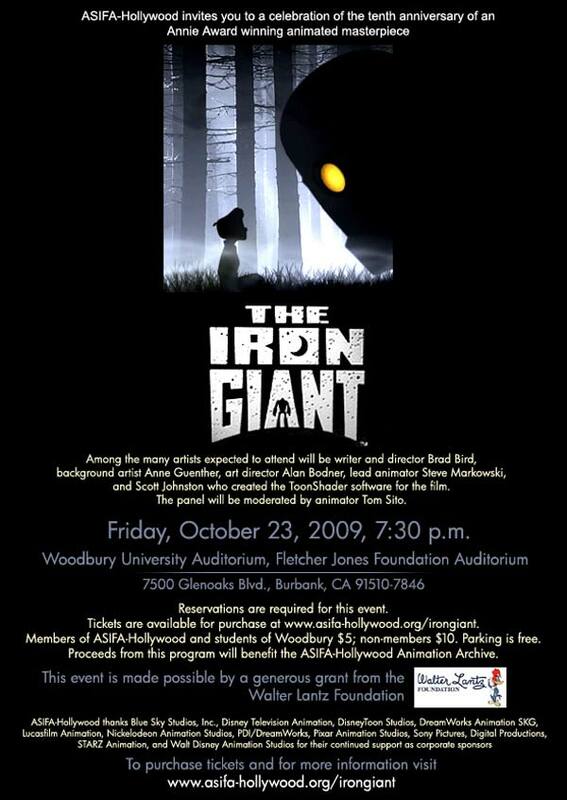 ASIFA-Hollywood will celebrate the tenth anniversary of the Annie Awards winning 1999 animated masterpiece "The Iron Giant", with an evening with lively discussion with some of the animators and crew members on Friday, October 23, 2009, at 7:30 pm, at the Fletcher Jones Foundation Auditorium, Woodbury University, in Burbank, California. Among the many artists expected to attend will be writer and director Brad Bird, background artist Anne Guenther, art director Alan Bodner, lead animator Steve Markowski, and Scott Johnston who created the ToonShader software for the film. The panel will be moderated by animator Tom Sito. "The Iron Giant is one of those rare films that flawlessly merged CG with traditional animation and represented superior storytelling," said ASIFA-Hollywood Vice-President Tom Sito. "ASIFA-Hollywood wants to showcase the individuals who made the iconic film, and the event will be extra-special with a rare appearance by Brad Bird."